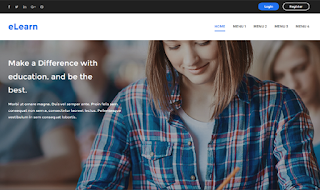 Writer Education Blogger template is the best solution for school, colleges, universities to make their presence on the internet. This template is designed especially for creating and selling courses online. It is powerful, outstanding and most simple to use. The modern edge design with latest web features makes the user experience best than ever. With its latest functionalities users as well as students would be able to facilitate themselves to the best. It is a perfect LMS (Learning management system) for Blogger BlogSpot user.